Shalom, Y’all. Walk down Broad Street in Charleston, South Carolina and a small ceramic plaque with these words greets you on Hadassah Rothenberg’s door. 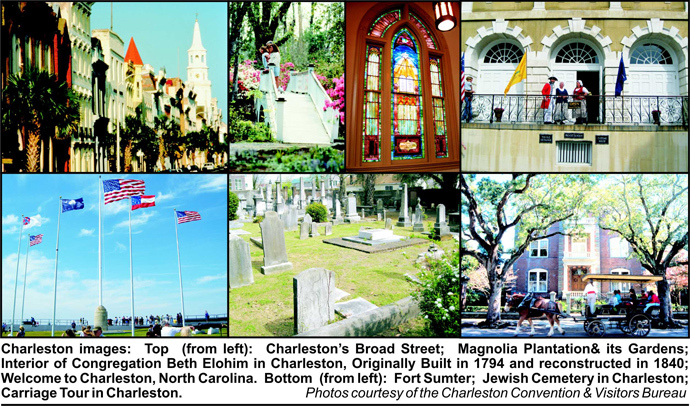 While this greeting may seem a peculiarity, in truth the Jewish Post’s recent trip to Charleston, South Carolina and Savannah, Georgia revealed a tale of two cities with a unique and rich Jewish history. 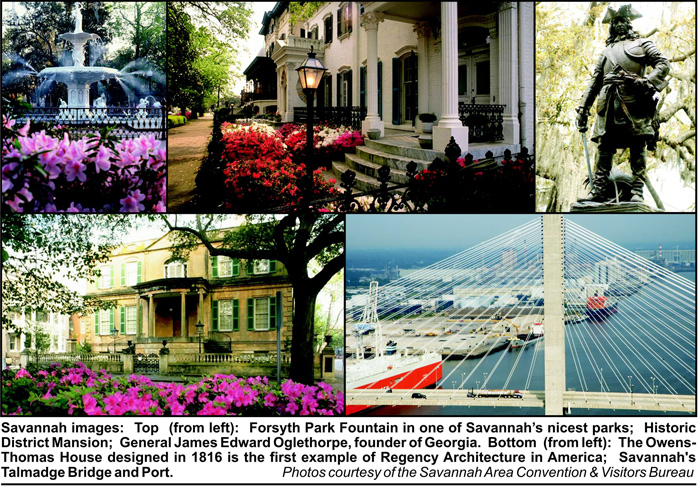 Get acquainted with the city by a trolley tour, or—even better—contact Harriet Meyerhoff, who owns and operates Jewish Tours of Savannah, for a knowledgeable and personalized tour of the city’s history and its Jewish heritage (email: tours@savannahsites.com or call 912-234-0014). Harriet brought us to Congregation Mickve Israel, the third oldest Jewish congregation and only neo-Gothic Jewish sanctuary in the United States (www.mickveisrael.org). Founded in 1733, the congregation’s small museum is filled with history, including the oldest Torah in America, a letter from General Robert E. Lee to a local Jewish pharmacist, and letters of well wishes from over two dozen American presidents. Harriet’s tour also included a historical overview, a trip to local burial grounds, and an account of Savannah’s contemporary Jewish community. Our accommodations, at the new Holiday Inn Express Historic District (119 East Bay Street, 912-231-9000) were not only convenient to everything, but the rooms and the service were top-rate. Rates average between $179-209 per night, but specials may be available at www.holidayinn.com. This facility is highly recommended. For a sampling of the region’s low country cuisine, make a dinner reservation at Alligator Soul, a wine-cellar bistro just a short walk from the hotel. This restaurant is a favorite among the locals. For an appetizer, start off with fried green tomatoes. There is always a fresh fish of the day from which to choose, and don’t forget to leave room for dessert. We recommend the apple and bourbon bread pudding made with fresh apples, toasted Georgia pecans and Kentucky bourbon. Another place worth checking out is the Gryphon Tea Room (337 Bull Street, 912-525-5880). The building once housed one of the longest running pharmacies in the United States called Solomon’s. The Solomon family has a long history in the area, going back to the American Revolution (in fact, George Washington called upon them for medical supplies). The building, located across the street from X Square and the Savannah College of Art and Design’s gift shop, has some of the original fixtures, including a wall of apothecary drawers, a tiled mosaic floor bearing the Solomon’s name, and old stained glass windows. Gryphon’s Tea Room serves high tea as well as a regular menu featuring salads, sandwiches, and pastries. The second boat of immigrants included 42 Jewish families. It started as a military state and offered freedom of religion. Synagogue contained the oldest Torah in America, written in the 1490s. Mordechai Sheftall was the highest-ranking Jewish officer in Revolutionary War. Jewish burial ground was dedicated in 1772. Charleston, South Carolina. Just the name exudes history, and genteel southern hospitality. As well as a place on a plethora of top ten and top twenty five city lists both nationally and internationally. And the sights of a bygone era, the sounds of horse drawn carriages transporting visitors down historic streets and the tastes of a roster of restaurants where culinary skills satisfy hungry diners all combining to make Charleston a delightful destination. The first decisive victory of the Revolutionary War and the first shot of the Civil War occurred there. The early rice economy spawned slavery at the same time as the large number of cathedrals gave it the nickname of the “Holy City”. It is no wonder that there is no shortage of things to learn about this exciting city. A wonderful place to visit is the Magnolia Plantation and Gardens … in the Drayton family for over three centuries and described by Charles Kuralt as “my greatest Charleston pleasure.” One can tour the five hundred acre property by foot, train or boat, visit the plantation house, learn about the history of slavery, and visit the Audubon Swamp Garden where alligators, herons, egrets and turtles can easily be seen. (www.magnoliaplantation.com). On the way to Magnolia or other nearby plantations, grab a bite at Home Team Bar-B-Que located across the Ashley River in West Ashley (phone number:  225-7479). This bustling roadside joint features all types of barbeque and has their own smokehouse. Go on a Thursday, Friday or Saturday evening and you will be treated to Bluegrass or regional touring bands. The owners are Jewish. Aaron Siegal is the sous chef, and Randy Abraham (from Cherry Hill, New Jersey) tends bars and books the bands. Charleston is also a great walking city. The waterfront, art galleries, shops and historic areas are all within walking distance from each other. Visit romantic East Bay Street with its many restaurants, homes and gardens, or go on an architectural or ghost tour. Visit Fort Sumter, where the Civil War began, and where history may have changed – if only President Lincoln accepted an invitation to attend the ceremony marking the retaking of the Fort by Union soldiers rather than fulfilling a prior engagement at the Ford Theatre. We had the good fortune to meet Janice Kahn who enthusiastically showed us the highlights of her city. Her Chai Y’All Tours cover the history of Jews in Charleston without neglecting the rest of the story. Congregation Beth Elohim is an incredible synagogue both inside and out. It is open for tours as well as Friday and Saturday services. The gravestones at the Jewish cemetery evidence the existence of Jews who lived in this area dating back to the revolution! Janice had a way to bring all this history to life in an informative and humorous manner. Be certain to arrange for one of her tours. She is reachable at: (843) 556-0664. As you can imagine, there are so many good choices of places to dine. We sampled a few that we thought were outstanding. Robert’s of Charleston located at 182 East Bay Street [843-577-7565] www.robertsofcharleston.com. Roberts offers a unique dining experience to those who appreciate fine cuisine accompanied by song and music. Robert, the owner of this five star establishment, sings a selection of notable Broadway tunes, and light classical music while his guests are enjoying the superb food. The prix fixed menu consists of beef, duck and fish courses each paired with an excellent choice of wine. Seating is limited so reservations are a most. Treat yourself to a special evening while in Charleston, and make a reservation at Robert’s! Slightly North of Broad (SNOB) located at 192 East Bay Street, 192 East Bay Street (843) 723-3424. SNOB has received kudos from such notable magazines as Gourmet, Food and Wine, Southern Living and USA Today. The exposed kitchen and high ceilings add to the charm of this renovated nineteenth century warehouse. This restaurant specializes in fish, game, vegetarian dishes and Low Country dishes. Chef Frank Lee has won awards for his innovative dishes which combine the resources of the area with his special blend of flavors. For starters, there is a wide selection of salads from which to choose. We ordered the grilled halibut as our main dish which was tender and moist. For vegetarians, there is always a vegetarian dish consisting of a wide variety of the best local vegetables. Aside from the acronym SNOB, there is nothing unfriendly about this restaurant. We highly recommend SNOB for a memorable meal. Fat Hen located at 3140 Maybank Highway, John’s Island (843) 559-9090. Not quite one year old, the Fat Hen has become one of the most popular restaurants in the Charleston area. The locals have fallen in love with the relaxed atmosphere and signature French-inspired Southern cooking. Many of the entrees are served with southern specialties such as collard greens and local butter beans. Appetizers are plentiful and include several choices of salads. This restaurant is a short car ride from the City of Charleston. Reservations are recommended. Tristan located at 55 South Market Street  534-2155. This fine restaurant features eclectic creative cuisine with a constantly changing menu. Local vegetables are paired with fresh fish and beef entrees. The cosmopolitan setting adds to the sophistication of this well regarded restaurant. Whether is lunch, dinner or Sunday brunch, you can be assured of a great meal at Tristan. Among the many choices of quality places to stay is Hadassah Rothenberg’s Broad Street Guesthouse located at 133 Broad Street,  577-5965 www.charlestonkosherbedandbreakfast.com. This upscale bed and breakfast is the only strictly kosher facility in Charleston. Hadassah, a transplant from Brooklyn, New York, has beautifully decorated each of the rooms. The bathrooms are new, the beds are big and very comfortable; it is a home away from home for couples and families. It is also the only place in Charleston where the smell of freshly baked challah permeates the main floor and makes it difficult to wait for the full breakfast the next day or for the Shabbat evening meal. Another great place to stay is the Charleston Marriott Hotel, 170 Lockwood Blvd. 723-3000 www.marriott.com/chsmc. Whether you are visiting for a few days or attending a conference, this new facility, accommodating 340 rooms, offers all the luxurious touches in a lovely setting and with all the amenities one would expect from a fine establishment. The staff is pleasant, free parking is included and it is an overall top notch hotel. There were so many events taking place in Charleston when we arrived that many hotels were fully booked. The Days Inn Historic District, 155 Meeting Street  722-8411 www.thedaysinn.com/charleston05262 was right in the center of town and just half block from the city market. The rooms were very basic and free parking was included. One final destination, for those that had their fill of Starbucks, is the Charleston Tea Plantation. It is a short car ride from Charleston at 6617 Maybank Hwy. on Wadmalaw Island  559-0383 www.charlestonteaplantation.com. The one hour tour of America’s only commercial tea plantation presents the process of tea making and of course features a tasting and sampling of its products. We only had three days to spend in Charleston with a full itinerary but even so there was a calming atmosphere, a slow pace that allowed us to enjoy the experience even more … almost like hurry up and take it easy. So hurry up to Charleston … it’s so exciting you’ll never be more relaxed. Visit www.charlestoncvb.com to learn about special events throughout the year.